These flavorful baked crab cakes are wonderful as an appetizer or entrée. They may be made in advance and refrigerated. You may use fresh or canned pasteurized crab. Put the mayonnaise in a bowl and whisk in the onions, green peppers, parsley, mustard, Worcestershire sauce, Tabasco, cayenne, lemon juice, salt, and pepper. Go very easy on the salt and pepper. Cover bowl and put aside for 15 minutes or so for the flavors to marry. Gently fold in the crab. Reserve, refrigerated, if you are doing this in advance. Melt 3 tablespoons butter in a small skillet and add the breadcrumbs. Cook over low heat until just golden, adding a little more butter if it seems too dry. Scrape into a bowl and cool. 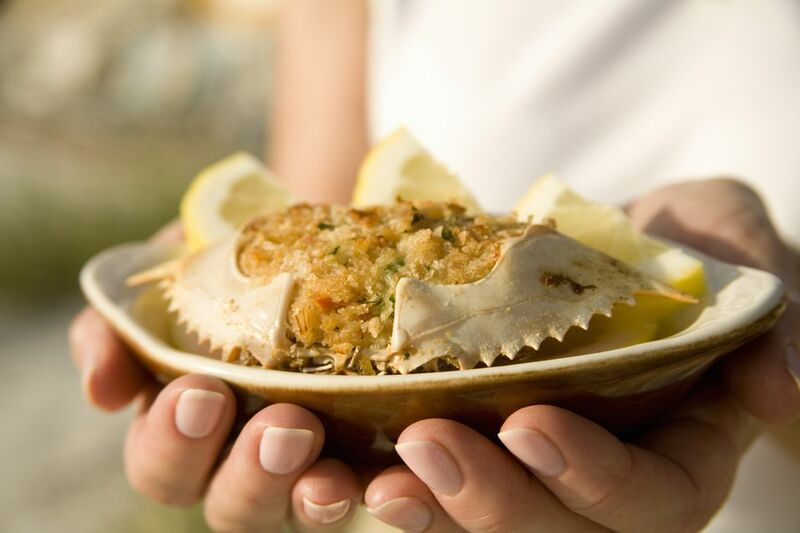 Arrange the natural or ceramic crab or scallop shells or ramekins on a baking sheet. Divide crab mixture among containers, mounding it a bit in the center so that it looks generous. Sprinkle the crumbs over the crab mixture. Bake on the top rack of the oven until bubbly and lightly browned, 10 to 15 minutes. Serve hot with parsley sprigs and lemon wedges. Source: by Bruce Beck (E. P. Dutton). Reprinted with permission.